This challenge is to make a Thank You card. Base card is black followed by a red panel. 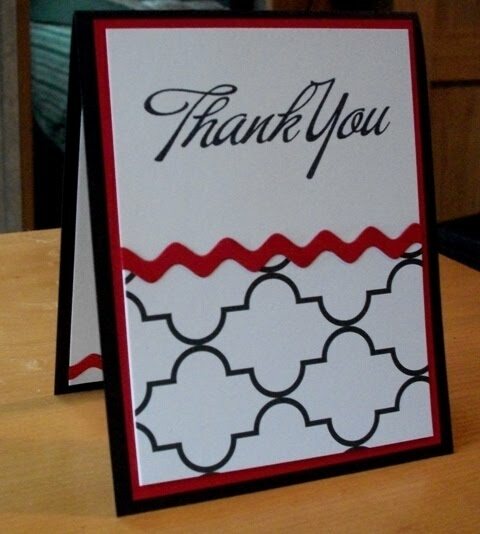 A piece of pattern paper was used on the bottom and placed on a white piece of cardstock. I used my new PTI ric-rac die...I LOVE it!! It is so cute and it's long so you can make a long strip. This piece was placed over the seam. I used PTI's Thank You stamp from Big & Bold Wishes. You must get this set. It's great. The inside was lined with white and another strip of red ric-rac. Thanks for looking! My goodness! You really rocked the VSN challenges!! So much fun! I love the paper on this one... the bold pattern goes great with the large sentiment!